A portrait of Lord Kitchener beside a quotation. 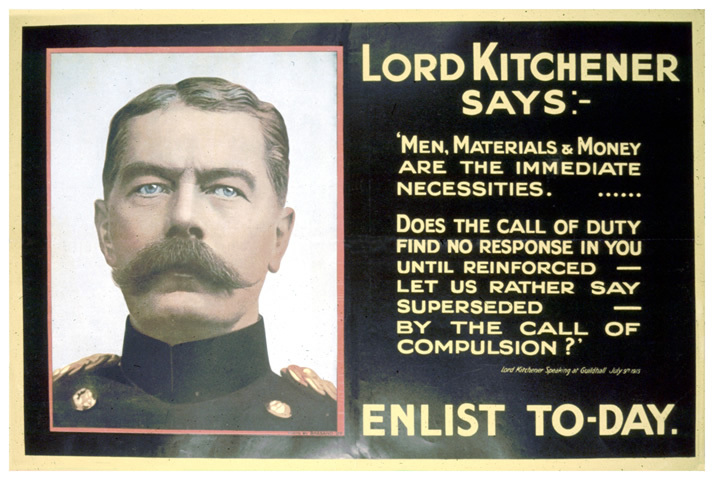 Poster Text: LORD KITCHENER / SAYS: - 'MEN, MATERIALS & MONEY / ARE THE IMMEDIATE / NECESSITIES / DOES THE CALL OF DUTY / FIND NO RESPONSE IN YOU / UNTIL REINFORCED-- / LET US RATHER SAY / SUPERSEDED-- / BY THE CALL OF / COMPULSION?' / LORD KITCHENER SPEAKING AT GUILDHALL JULY 9TH 1915 / ENLIST TO-DAY.